A million thank yous to Houghton Mifflin Harcourt for putting it up for 2 days promotion on netgalley, you made my day. Presenting my views of the much anticipated book, His Fair Assassin #1 Grave Mercy by Robin L. LaFevers. Why be the sheep, when you can be the wolf? Seventeen-year-old Ismae escapes from the brutality of an arranged marriage into the sanctuary of the convent of St. Mortain, where the sisters still serve the gods of old. Here she learns that the god of Death Himself has blessed her with dangerous gifts—and a violent destiny. If she chooses to stay at the convent, she will be trained as an assassin and serve as a handmaiden to Death. To claim her new life, she must destroy the lives of others. Ismae's most important assignment takes her straight into the high court of Brittany—where she finds herself woefully under prepared—not only for the deadly games of intrigue and treason, but for the impossible choices she must make. For how can she deliver Death’s vengeance upon a target who, against her will, has stolen her heart? We are born in this world for a reason; a purpose that must be seen through. No one comes here to get wasted. Some are born to lead, some to follow orders while some are to carry out the almighty's will. Centered around this fact is the series His Fair Assassin. Of death's own hand-maidens, looking for his marquee and met out his will. Based in 1485 circa, Brittany, young Ismae is rescued from a heartless and cruel life; raised from the cellar door and taken in by the convent of St. Mortain and trained in the arts of being an assassin, carrying out the will of Mortain, death himself. Ismae is well on her path to take the final vows when she is given the final test, to go to the royal court and root out the treachery abound, protect her lordship, the Duchess and prevent another war with the French. With her only in this ordeal, the closest adviser of the Duchess, Lord Duval, Ismae plays her role perfectly but all of Ismae's training proves to be wisp of smoke in the face of the cut throat life of court but can she protect heart in this extraordinary test... Maybe St. Mortain is with mercy and not vengeance after all. Narrative of a period dialect and the grace of the french tongue, Robin LaFevers delivers a tantalizing masterpiece. There is treachery, there is deceit, there is vengeance, but there is also love and mercy. It is but how we interpret the ways of the lord that matters not what people tell us about them. The plot is well layered and extremely well textured, the characters fleshed out, very believable and easy to connect with and the conclusion satisfying. Ismae, Duval, the Duchess, Beast, De Lorney and the lot offer us every spices of life and the chemistry between Ismae and Duval is very attractive and sure enough we find ourselves rooting for them both till the end. 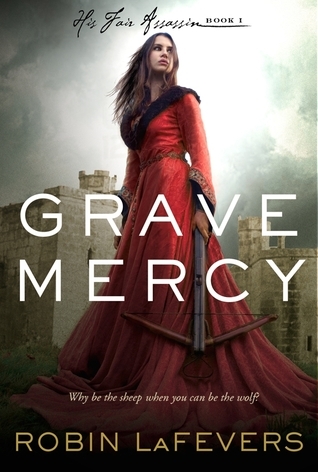 "Grave Mercy is but the beginning - a powerful beginning at that - leaving us hungry for more"
I saw so many different reviews of this one (good and bad), but I really have a feeling that I would love it - the cover is simple perfection and the storyline seems amazingly good. I'm so glad you loved this as well! Ismae is AWESOME.